Make your way to Audi Tysons Corner to check out the new new 2019 Audi A6. We have a showroom of new A6 models right here in Vienna, VA. Our goal is to get you behind the wheel of your new A6 during your visit. Continue reading to learn more about the 2019 A6 inventory here at Audi Tysons Corner. Your Audi is in good hands at Audi Tysons Corner. We have a dedicated service center with factory-trained Audi technicians ready to assist you. Our technicians care about your Audi as much as you do, and we are here to make sure your Audi is in pristine condition for the long run. We provide numerous services to keep your Audi performing at its best. Your Audi deserves the best, and that’s what you will get at Audi Tysons Corner. Continue reading to learn about our available auto services and incentives. Easily get the Kelley Blue Book fair-market value of your vehicle with Audi Tysons Corner. Our customers can take advantage of our simple and conveniently online trade-in tool right now. We want to help get you out of your current vehicle and behind the wheel of a new Audi today. Our goal is to get you the best offer for your trade, which you can then apply towards to the purchase of a new Audi. We strive for satisfaction and will work to make sure your next trade-in experience is a breeze. Audi Tysons Corner is just a short drive away with the new Audi you want in stock right now. We are honored to be your premier Audi dealer with a selection of best-selling models available with outstanding service and support. Our sales associates take pride in assisting you and will work to get you the Audi you’ve been dreaming of during your next visit. We are located minutes from anywhere in Vienna, VA with a state-of-the-art showroom and a wide selection of new and used models. For years, Audi has been the unparalleled leader in the delivery of luxury performance vehicles. 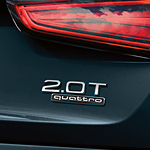 The unique blend of premium styling partnered with impressive performance features makes the latest Audi Q3 an ideal choice for those drivers looking for a new compact crossover. The vast choices of Q3's at Lexus Monterey Peninsula will have all of your personal needs and preferences covered.